To eat crow implies, at its mildest, an unpleasant action since the flesh of the crow is believed to be unpalatable. As an expression, it denotes the anguish of humiliation at having to admit to wrongdoing or fallability, usually in the wake of hubristic actions or words. 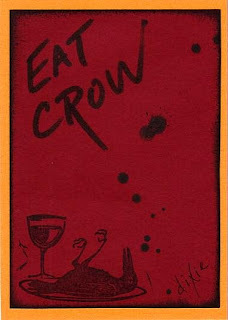 Have you ever had to eat crow?